Cozy, warm, pleasant, and welcoming; all words that you hope people think of when they are describing your home. If you live in a small living space, you start to realize that it's not as easy as it looks. How are you going to take this small space and transform it into something breathtaking? It seems so easy when they do it on HGTV but why is it so nerve-racking now? With small house interior design, there are always sets of do's and don'ts that govern how a space transforms. A small space is no exception. If anything, the stakes feel higher because you have less area to work with in your home. However, working with a small space should not feel daunting. At Omorfia, we have picked up some tips and tricks to help you as you try to navigate interior design for your small house or living space. When doing interior design of a small house or small room, it is always best to make the room as clutter free as possible. Having less clutter in a room gives the illusion of more space. Therefore, when looking for furniture, we recommend finding pieces that can conceal items. For example, a console would offer ample interior storage and shelving, while providing a more sleek and solid exterior. Coffee tables with hidden storage offer the same thing. If you use your living room often, chances are that you have a lot of stuff floating around that you need daily. Maximize your space by buying furniture with hidden storage. Going along with this, we recommend buying furniture that has a dual purpose. Providing more than one use helps to make small areas more functional. An example of a small bedroom would be to buy a daybed instead of a full/queen sized bed. You can use it as a couch during the day, thus maximizing that space when you need it. It can easily convert it into a bed at night. Many day beds have additional storage below as well. A new trend that has taken over by storm is open shelving. While it can look amazing and is very appealing, we do not recommend it for small spaces. It may seem like not having cabinets would make a space feel larger than a room full of cabinets. In reality, if you do not have items strategically placed on the open shelving, it can seem like more of a chaotic mess than a clean, spacious look. Choosing some well-designed tall pieces can accentuate high ceilings in a small room. This height can make the room look and feel expansive. Even if your ceilings are not that high, having a tall bookshelf or cabinet can trick the eye into thinking that they are higher than they are. Again, having storage is key to small space living. Having floor to ceiling storage will make the height of your room seem taller, and provide a spot for all the things you accumulate. Never underestimate the power of a strategically-placed mirror in a small space. Mirrors can make the room appear double in size. That goes for any place, a bedroom, dining room, or living room. 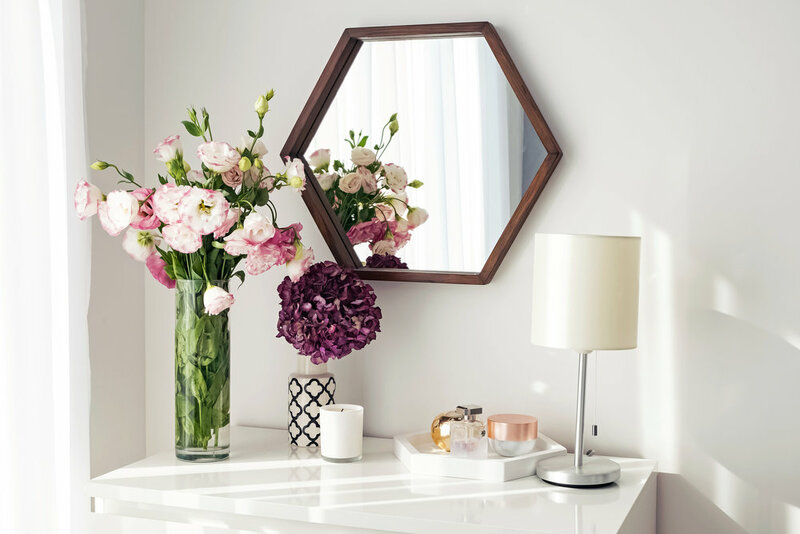 Placing a mirror adjacent to a window or a sliding door can instantly add an airy and spacious vibe to your small space. This is an easy and inexpensive trick that we highly recommend if you are living in a small space. Small Space doesn't Necessarily Mean Small Furniture. A lot of times people tend to think that the size of your room dictates the size of furniture to buy. However, you should take that tip with a grain of salt. 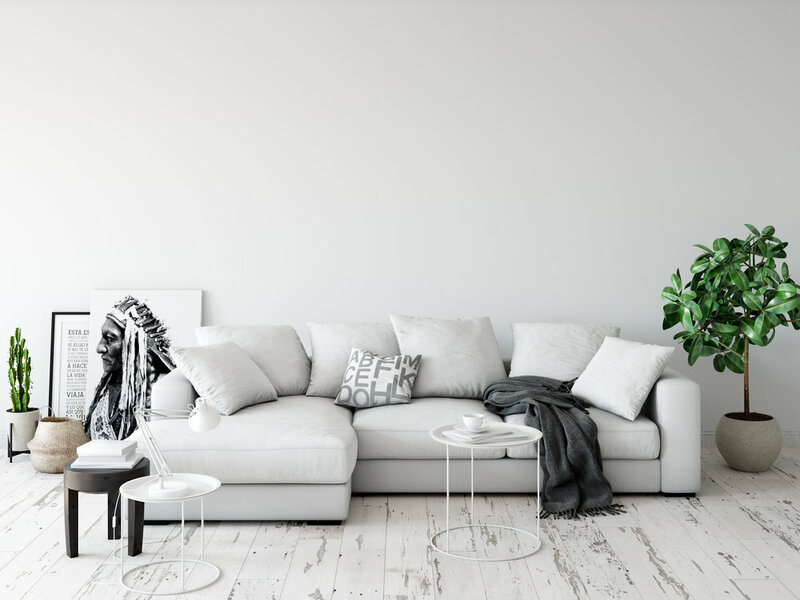 While of course, you don’t want to buy a piece of furniture that takes up half of your room on its own, you don’t necessarily ONLY have to stick to small furniture. Say, in a living room, you can buy one or two larger pieces and then some smaller pieces to give some contrast. Having only small furniture can create awkward spaces and gaps throughout the room. When you are thinking of painting the walls of a small space, think light and bright. Light colors tend to be more reflective and make a space look more open and airy. Now we know, white walls everywhere are not for everyone. Take a trip down to your nearest paint store, and you will be surprised at how many light and bright colors you can find. For years people have argued not to use dark paints in small spaces because they tend to make areas look even smaller. And while, yes that is true, we believe that throwing an accent wall here or there with a splash of color can have pros that far outweigh the cons. While the interior design of a small house is all about maximizing your space, it is also about creating a space that is unique to YOU. If that means throwing some darker paint up, so be it. All in moderation. Having one dark wall surrounded by light walls will make the space visually appealing without taking away the look of square-footage. If you are dealing with some design limitations because of your small space living or need help with finding a style and design that compliments you, we are here to help. We offer over-the-phone consultations and offer fantastic interior design for low prices. Call us today at (605)223-0193 for a free 30-minute consultation with one of our interior designers. Whether it's commercial, residential, exterior, interior, large space or small, we are here to listen to your needs and wants and to come up with a design plan. If you like what you hear during our consultation and want to learn more, we also offer 90 minutes of personal design where we meet with you, all for $99. Let us help bring beauty into your space. Call Omorfia today!